Located in Cavezzo, Italy, MIX has been manufacturing mixing systems and industrial components for bulk solids handling, dealing with powders, granules, fibers and pastes since 1990. The MIX range of mixing equipment includes mixers, reactors, dryers, humidifiers, heaters, coolers, sterilizers, granulators, and stirred bunkers. Processes can be executed in batch or in continuous mode. Always attentive to the needs of its customers, MIX developed a new range of reactors and dryers suitable for specific challenging processes. With MIX equipment, customers are now able to manage pressure and temperature variations, dangerous and toxic dry raw materials with vacuum process, even in an ATEX classified environment. 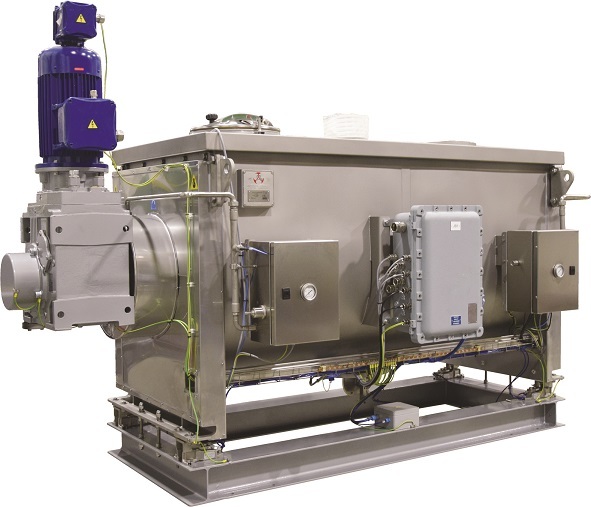 Recently MIX delivered a system to a leading Chemical group with the aim of batch vacuum drying a crystalline salt. This raw material is toxic, explosive, difficult to treat, and tends to clog. At the beginning of the process, the crystalline salt has a variable content >5% of methyl alcohol. The purpose of the process is to reduce the content of methyl alcohol to a value <0.1%. The system supplied by MIX includes one mixer/stirred bunker with ribbon shaped tools and one mixer/reactor with paddle shaped mixing tools. The material of construction is stainless steel AISI 316. The ribbon stirred bunker continuously receives the raw material from a previous treatment and, like a buffer IBC, feeds the mixer/reactor whenever it is required by the system logic of operation. Raw materials enter into the dryer at 23°F, at atmospheric pressure. The drying process is executed at a pressure of 1.02 psi absolute, at a temperature of about 68°F as the material is perishable above 86°F. 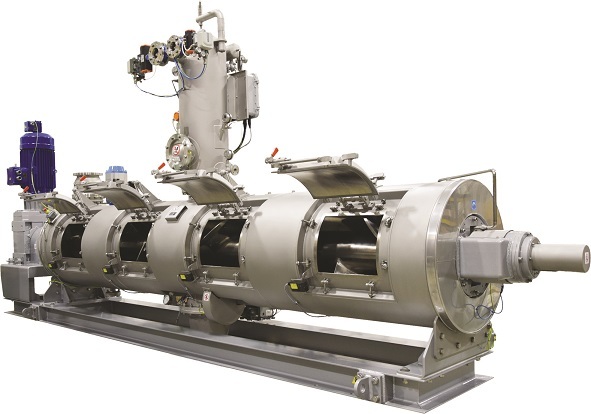 The reactor/dryer is equipped with heat exchanger for hot water, both on the vessel and on the rotor shaft for a better performance and has an ATEX certification II 2G suitable for use in classified zone 1, for both external and internal parts. The inerting of the mixing/drying chamber is guaranteed by the introduction of CO2 through the flushing of the rotor shaft seals. The automated system constantly analyzes the variations of temperature and of vacuum level inside the mixer/dryer. The system can compare actual levels of temperature and pressure with process target levels and consequently manages to calculate the time needed to complete the process. In this way, it is the system itself that autonomously determines the most appropriate moment to discharge the dried product and to start a new batch. The entire process lasts approximately 60 minutes, including filling and emptying of the mixer/dryer, which is equipped with a special self-cleaning de-dusting filter, heating system, and insulation to prevent condensation. The filtering elements in stainless steel are suitable for continuous use, even in the presence of acid products. Every MIX mixer is tailored and custom manufactured to satisfy even the most demanding and specific requirements. Each mixer is designed to be able to optimally perform the productive tasks, for which it has been conceived. Thanks to the advanced internal test laboratory, it is always possible for MIX and its customers to securely test new recipes and to reproduce even the most complicated industrial production processes. In this way, it becomes much easier to determine the characteristics of each raw material and, therefore, identify the most suitable mixing techniques for obtaining the desired result. For more information, call 815-880-8669 or visit mix-sys.com.